Form 1 ~ MIT Alumco's Stereolith 3DP Launches! MIT alumco Formlabs Kickstarts their 3D printer Form 1! 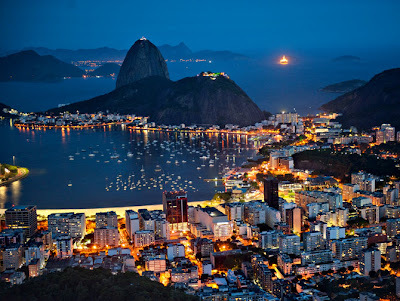 Lovely Rio ~ Spotlights on Brazil's Blessed City! 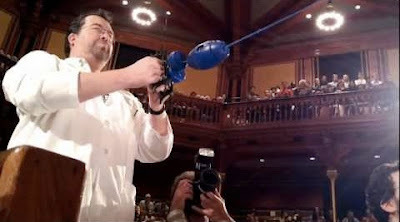 Moments of Science ~ Latest IgNobel Interludes! 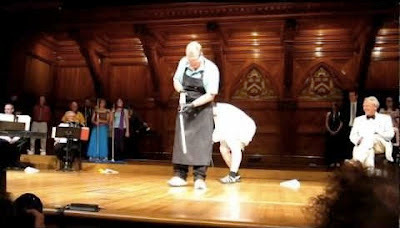 My esteemed Harvard colleague Daniel Rosenberg (of InDemoVeritas fame) and I performed two Moments of Science at the latest IgNobels. Fast-forward to 1:11:00 and to 2:01:25 to see the goodness! Here's Daniel and me plugging in for Moment #1 -- Balancing Vibes! And here's snapshot of me starting Moment #2 -- The Doppler! 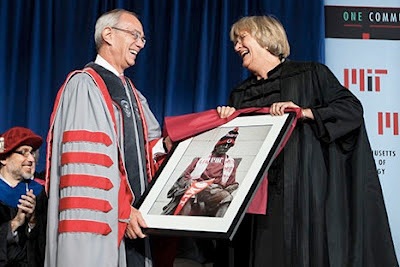 Rafael Reif ~ MIT's 17th President Inaugurated! 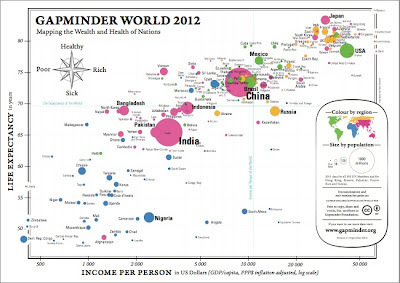 Global Trendscape ~ Gapminder 2012 Worldview! Sperm Cam ~ Imaging Elusive Spiral Swimmers! "A new three-dimensional imaging technique has revealed spiraling movements that had previously only been inferred from two-dimensional data. [This is the] first large-scale, high-resolution recordings of human sperm in three dimensions, tracking more than 1,500 cells over several hours. Human sperm have eluded such detailed observation in the past. Their heads are just 3–4 micrometers long and can only be seen under high magnification, but the cells zoom around at up to 100 micrometers per second, ducking in and out of focus or darting out of range in an instant." 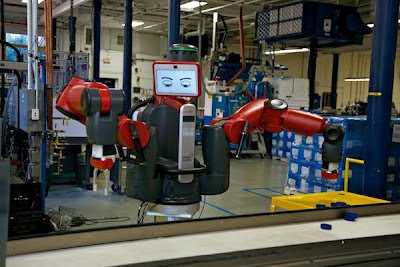 "...a revolutionary new category of Robot [...] capable of applying common sense behavior to manufacturing environments. Affordably priced, versatile and safe enough to work shoulder-to-shoulder with people, Baxter robots redefine how small, mid-size and large domestic manufacturers use automation to compete with manufacturers in low-cost regions of the world." DailyMail spots Aussie Fire Whirl! 100 ~ Dutch Baby to Centarian Speak Their Ages! Alexander Lew in Wired Autopia says It’s a Bus. It’s a Train. It’s Both! Tethys & Rings ~ NASA's Cassini Spots Saturn! 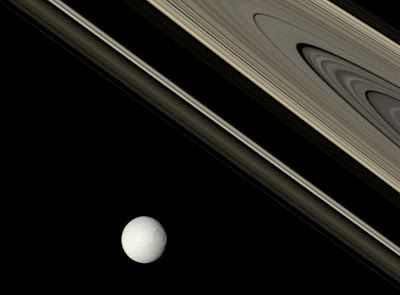 See Saturn's Bright Tethys and Ancient Rings via NASA's APOD! 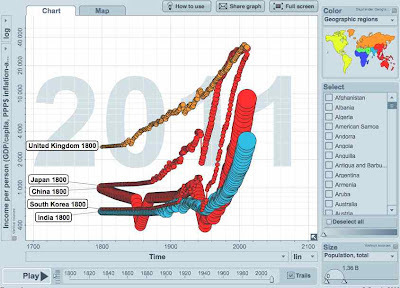 Political Heatmap ~ US Red-vs-Blue 1920-2008! Acoustic Levitation ~ Argonne's Sonic H2O Trap! "...uses two small speakers to generate sound waves at frequencies slightly above the audible range – roughly 22 kilohertz. When the top and bottom speakers are precisely aligned, they create two sets of sound waves that perfectly interfere with each other, setting up a phenomenon known as a standing wave. At certain points along a standing wave, known as nodes, there is no net transfer of energy at all. 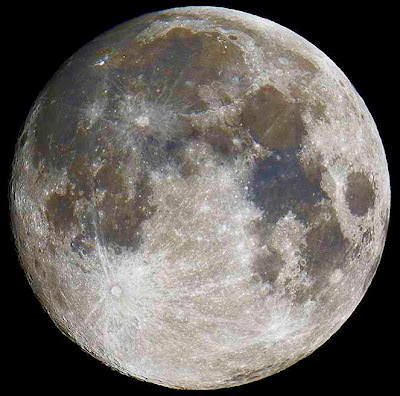 Because the acoustic pressure from the sound waves is sufficient to cancel the effect of gravity, light objects are able to levitate when placed at the nodes." Hula Cam ~ Imaging Delights from Burning Man! Nice photonic joy via the Hula Cam at Burning Man! "...far too many primary school aged children -- an estimated 67 million worldwide -- will never enroll in school. These children are generally the poorest of poor, for whom even a "free" education comes at too steep a price. For these families, sending children to school often means fewer hands laboring to support the family. 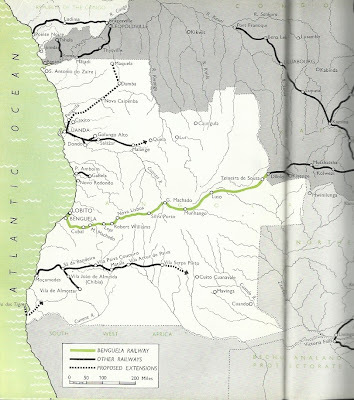 [...] it is the poor, rural girls who most often stay out of school. Take a look at this new video that shines a spotlight on the role land ownership can play in getting these vulnerable groups into the classroom..."
Screening Day ~ Mercy Ships in Guinea-Conakry! "This important event is when we look for potential patients for our surgical slots throughout the next ten months. Screening day is advertised through radio, partner NGOs, churches, and other media. It usually attracts many people, numbering in the thousands. [...] My role on Monday was primarily crowd management, and we encountered much desperation as people tried to crowd their way to the front of the queue -- especially outside the gate on the road. But despite having to tell people to move or to stop pushing, I was struck that all of this apparent desperation is fueled by genuine need and poverty -- and also a very real hope. A hope that finally they will find acceptance and love and lasting healing. I saw many people with facial tumours, cleft lips, burn contractures, the flesh-eating disease Noma, and many others. I saw not only desperation, but also the hope in their faces. And it made my heart swell, for this is why we are here." CineMoco ~ Camera Motor Controls by Cinetics! "...a compact motor controlled dolly and slider for video and timelapse photography. [...] The modular system delivers camera moves ranging from dolly shots to motor controlled timelapse, and you can carry it on your back." Check it out and back them! "...a 3-D immersive game designed to be part of the master planning process for Boston's Chinatown. [...] you'll then be tasked with considering the future of the neighborhood by walking through and commenting on proposed development sites. 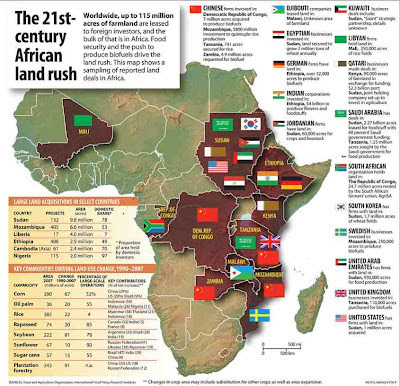 Every one of your comments and decisions will be shared with real life decision-makers." 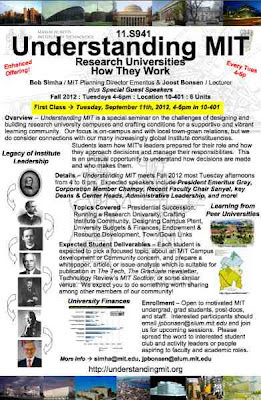 My colleague Bob Simha and I are hosting our Understanding MIT seminar again this Fall 2012 every Tuesday afternoon 4-6pm starting next week September 11th to survey research universities and how they work, with the Institute as our live-case study. Each week, we invite a different senior academic, administrative, and trustee leader of MIT to share with us what they do to help the Institute stay vital in the short, medium, and long term -- and ask what we can do to be pro-active in improving MIT as well. This is part of my larger action-research agenda on understanding creativity hubs and innovation ecosystems. 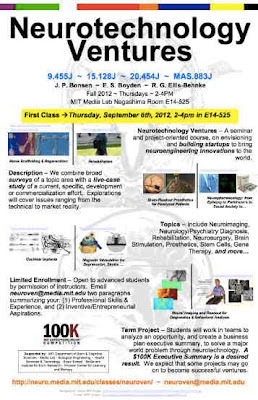 My MIT colleague Ed Boyden and I (with Rutledge Ellis-Behnke in Germany) are again hosting our Neurotechnology Ventures class this Fall at the Media Lab starting Thursday afternoon 6 September 2012 from 2-4pm. This course is all about envisioning, planning, and building ventures -- both entrepreneurial startups and intrapreneurial product-lines or business units -- to bring neuroengineering innovations to the world. 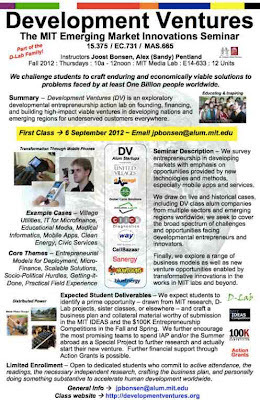 My MIT colleague Alex (Sandy) Pentland and I are again hosting our D-Lab Development Ventures class this Fall 2012 at the Media Lab, this time with special focus on frugal, DIY, and ultraffordable technologies as well as exponential innovations including mobiles, big data, and analytics. Filament Eruption ~ NASA Spots Solar Whiplash! Good time to wink at Neil! Kuroshio Sea ~ Kids spot Churaumi Aquarium! 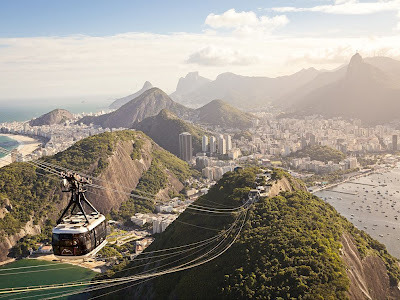 "38 apartments with total floor area of 2,508 m² constructed of large modules, the size of the entire apartment. 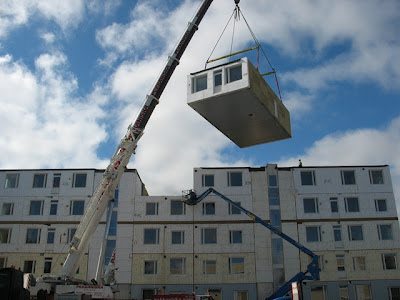 The prefabricated modules as well as the lift shafts are delivered to site as single elements. The building consists of 38 apartments (modules), the largest with a surface area of 73 square meters." "Gold electrodes and wires just a few hundred nanometers thick are deposited on silicon wafers by conventional means, then peeled off and applied to stretchable polymers. The serpentine wires elongate when the polymers stretch, either when the balloon inflates in the heart or as the patch moves around on the skin. The electrodes measure electrical impedance to detect the electrical signals in cardiac tissue or moisture levels in the skin. The company is building on lab prototypes made by University of Illinois materials scientist John Rogers, a company cofounder. [...] In addition to its hydration patch, it is working on patches that use sensors to detect heartbeat, respiration, motion, temperature, blood oxygenation, and combinations of these indicators. 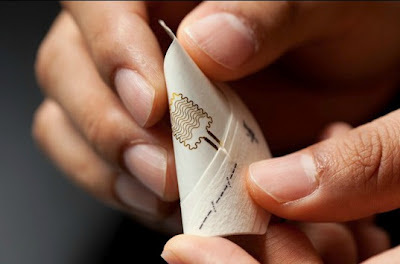 MC10's skin patches can wirelessly transmit information to a nearby smartphone." "Our flat lens opens up a new type of technology,” says principal investigator Federico Capasso, Robert L. Wallace Professor of Applied Physics and Vinton Hayes Senior Research Fellow in Electrical Engineering at SEAS. “We’re presenting a new way of making lenses. Instead of creating phase delays as light propagates through the thickness of the material, you can create an instantaneous phase shift right at the surface of the lens. It’s extremely exciting.” [...] The flat lens eliminates optical aberrations such as the “fish-eye” effect that results from conventional wide-angle lenses. Astigmatism and coma aberrations also do not occur with the flat lens, so the resulting image or signal is completely accurate and does not require any complex corrective techniques. The array of nanoantennas, dubbed a “metasurface,” can be tuned for specific wavelengths of light by simply changing the size, angle, and spacing of the antennas. “In the future we can potentially replace all the bulk components in the majority of optical systems with just flat surfaces,” says lead author Francesco Aieta." DIY Toy Car ~ Cameroonian Kid Proto-Engineer! "The film was created by Raúl Tomás Granizo, who was raised in Spain but fell in love with Patagonia -- and you can see why. He is the founder of wildglimpses, and is a freelance wildlife filmmaker and nature photographer always looking for the essence of nature. We think he has captured it supremely here!" Pulse of Fire ~ NASA MODIS Sees Earth Burning! DailyMail spots NASA MODIS-enabled Earth Observatory visualization of annual Pulse of Fires! MIT 24/7 ~ Saluting our Essential Operators! 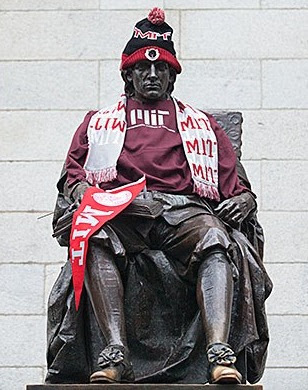 Nice Labor Day salute from MIT to our essential operators who ensure smoothly running campus systems 24/7!